Read an essay based on the book. Whether at parties, around the dinner table, or at the office, people talk about politics all the time. Yet while such conversations are a common part of everyday life, political scientists know very little about how they actually work. 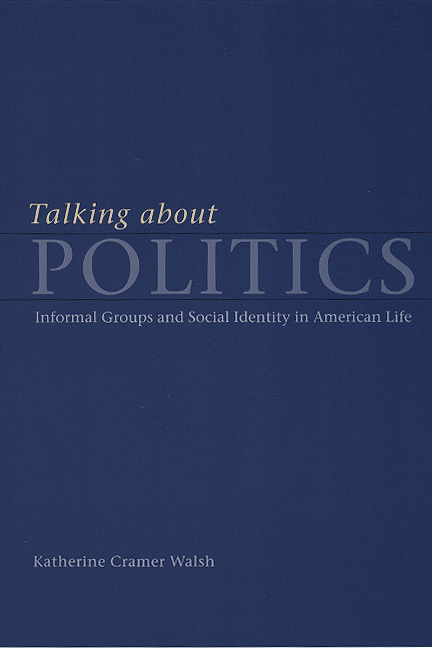 In Talking about Politics, Katherine Cramer Walsh provides an innovative, intimate study of how ordinary people use informal group discussions to make sense of politics. Walsh examines how people rely on social identities—their ideas of who "we" are—to come to terms with current events. In Talking about Politics, she shows how political conversation, friendship, and identity evolve together, creating stronger communities and stronger social ties. Political scientists, sociologists, and anyone interested in how politics really works need to read this book.